The Pool and Patio Cabana Islander Lounge assures you and your friends a fun and relaxing summer. 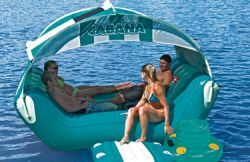 With room for 6 and tons of features, this one-of-a-kind inflatable is perfect for entertaining both on and off the water! Constructed of heavy-gauge PVC with a detachable wind-resistant nylon cabana top. 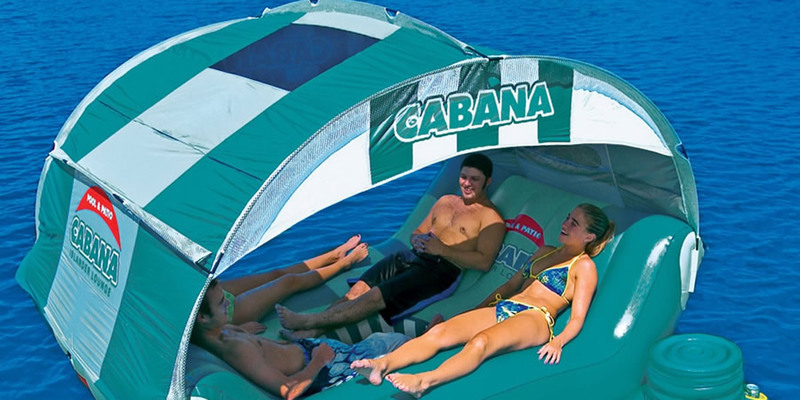 Also includes a center swim porthole, a boarding platform, and a floating 16 QT cooler that can be tethered by grommet to the Cabana Islander. Cooler includes zippered lid, cup holders, rope grommet, and molded PVC handles.